Toy marketers do their jobs very well these days and can convince my kids that a $10 ball will bounce higher than a $2 ball or that they absolutely must have a new video game to make their life complete! One of the challenges that I have faced over and over again as a parent is keeping my mouth shut when one of my kids buys a toy that I know will be living under the bed or in the back of the closet once the newness wears off. That’s assuming that the toy doesn’t actually break before then. However, I firmly believe that children need to have the opportunity to make their own decisions with their money (good or bad) when they are young and the consequences are minor. Think of it as teaching your child to ride a bike. 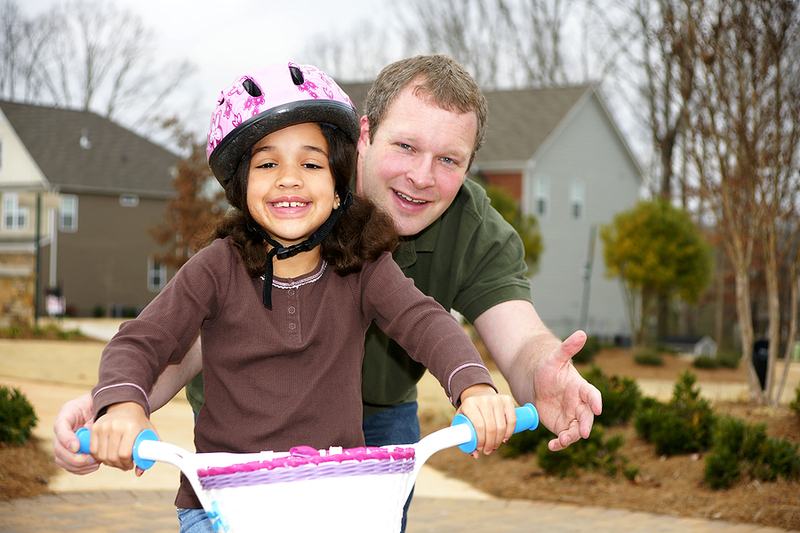 You make sure they are safe by wearing a helmet and riding in a safe place. You talk with them about how the bike works and demonstrate riding a bike for them. You even hold on to the back of the bike for little bit to make sure they don’t get hurt. Ultimately, though, they need to practice by themselves --- over and over to get good at riding the bike. We should apply the same method to teaching our kids about money. We can talk with them about how much items cost and how to budget for items that we really want. We let them see us using money on a daily basis, from buying groceries, paying bills or going to the movies. We even put a few safety rules in place, such as limiting their allowance and not allowing them to buy dangerous items. However, what I have found most difficult is “letting go of the bike” and allowing them to use their money as they wish. It is so hard to watch them spend four weeks of allowance on a toy that you know will lose its pizazz quickly. Yet, this is probably the most important part of the process of learning smart money management skills --- practice! It is better to let them make spending mistakes now, when the consequences are small, instead of when they get their first credit card. There will be times when they make good choices with their money and there will be times when they become disappointed with their decision. They can learn from both experiences. What do you think is the most difficult part of teaching money management skills to your child? I'm with you on having difficulty over-riding my protective instincts and letting them experience making mistakes. I need to focus on the teachable moment after the spending rather than before. I also don't want to get so focused on teaching them about money that I over-value it. When my eldest asked me "Mom, why is money so important?" it scared me a little. I want to make sure that I keep it in perspective and not make it the be all and end all of life. Great point about keeping things in perspective. I agree! I can tell that I have been talking too much when the kids' eyes start rolling back into their heads. I am sure my voice has become the "waa waa waa" teacher voice from the Charlie Brown cartoons! Sometimes finding that balance in life can be challenging. Lately, I have been trying to choose my words carefully. For example, if the kids ask us to have a family night at the movies, I say that "we are choosing to use our money for other things" instead of "we can't afford this right now." Just trying to keep things positive instead of justifying why we "can't" do something!